The original Mercedes M-Class, sometimes confused with the Mercedes Benz ML Class was among the first premium SUVs to go on sale in Europe, and managed to build quite a loyal following based on the car’s abilities. This sector of the market has grown considerably and is now one of the most competitive. Mercedes has managed to stay competitive by introducing new and innovative ideas into their vehicles. Their newest introduction is the new Mercedes M-Class. Mercedes has deliberately kept certain features that distinguish the M-Series from other brands making the vehicle instantly recognisable. For instance, the rear window and front grille have kept their similarity to the original car. Other design features are completely new and geared toward keeping the M-Class modern and appealing to the new generation of buyers. Of course the car also sports the traditional Mercedes grille. One of the most significant changes on the new M-Class is the car’s new chassis design. The new design gives the car exellent off-road abilities without compromising the car’s ability to deliver a smooth on-road experience. The car’s off-road ability is enhanced by a wide range of electronic devices. The car comes with a high level of standard specification. Many of the car’s features are designed to enhance the driving experience whether driving on-road or off. Features such as ABS, a low ratio gearbox, differential locks and increased ground clearance all add up to a much more practical and functional vehicle. The M-Class was designed with families in mind. The car boasts improved passenger room and a large boot. The car can be tough when weather conditions demand it, and the car can be comfortable and refined when taking the family to run errands or on longer trips. The M-Class is an expensive purchase and boasts improved fuel efficiency but fuel economy is still somewhat poor. Maintenance and insurance costs will also run high, but the good side is that the vehicle performs well both on-road and off. The ML-Class provides excellent head and legroom for all passengers. Boot space is very good and increases with the rear seats folded. An electric tailgate made the options list and is a very tempting and practical option. The car’s controls and dials are easy to use and clearly labeled. The integrated COMAND system which operates the trip computer, audio system, satellite navigation and telephone can be a little intimidating at first but is worth taking the time to learn. The basic controls are duplicated on the steering wheel. This car is loaded with features geared towards improving comfort.Electric sports seats come standard on the Sports models. 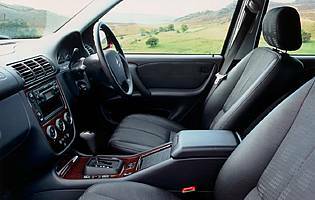 The seats offer excellent support and comfort as well as a wide range of adjustment. Other aspects like the steering wheel and mirrors are easily adjustable and offer a lot of practicality. The car provides a smooth ride and the cabin successfully minimizes outside noise. The car provides good accessibility but requires a small step up to gain access to the car’s cabin. Otherwise accessibility to the front and rear seats is relatively unhindered. The M-Class is easy to park. The car provides excellent all-round visibility and enjoys light steering at low speeds. Parking sensors do not come fitted as standard but shouldn’t be necessary. Brand new, it would cost anywhere between £48,190 and £86,920, on the other hand you could get a second hand Mercedes Benz M Class which would cost anywhere between £1,600 and £105,000…. So quite a lot of room to play with! The M-Class delivers a quiet and refined ride and is completely practical and enjoyable for daily use. The car is actually very fun to drive and has some decent off-road abilities. The engine options are more than capable of powering the M-Class and steering is accurate. The M-Class would make an ideal family car, with good all-round passenger space. The cabin can comfortably accommodate most passengers and the boot is large and ideal for accommodating luggage. This is probably not the ideal first car. Despite how easy it is to drive the M-Class it is an expensive purchase with high running costs. Insurance will also be high and the car may be too large for the needs of most newly licensed drivers. Many of the M-Class’ problems with fit and fiunish have been successfully addressed in this generation. The M-Class is quality built with a high standard of fit and finish. The cabin’s materials feel good to the touch and look high-class. The car comes equipped with unique security features such as the use of an electronic rather than metal key for the ignition. The tailgate is also well protected, while the luggage cover hides valuables from sight. Safety features include ABS and airbags, the M-Class also comes with Neck-Pro head restraints that are designed to react in the event of a rear end collision. PreSafe gathers information from various sensors throughout the car and prepares the vehicle for an impact or impending accident. The car is equipped with a standard radio/CD system with eight speakers. The car’s basic functions are duplicated on the steering wheel. The interior has a high quality feel and boasts quality materials. The majority of the car’s interior is black but the sporadic metal trimmings keep the interior from looking too dark. The Mercedes-Benz M Class has successfully made enhancements in all the right places. The car has managed to keep up with all the changes and maintain modern looks and the latest in technology. The car has focused on comfort and offers a very valid and viable on-road and off-road driving experience. it’s competitors include the BMW X5, the Audi Q7 the Lexus RX and the Jeep Grand Cherokee.